This product is non-dangerous goods, according to the general goods transportation. 1. Confined storage, the best in the next 15 ~ 25 ℃ storage. 5. A shelf life of three months is expected, B is expected for 3 months. 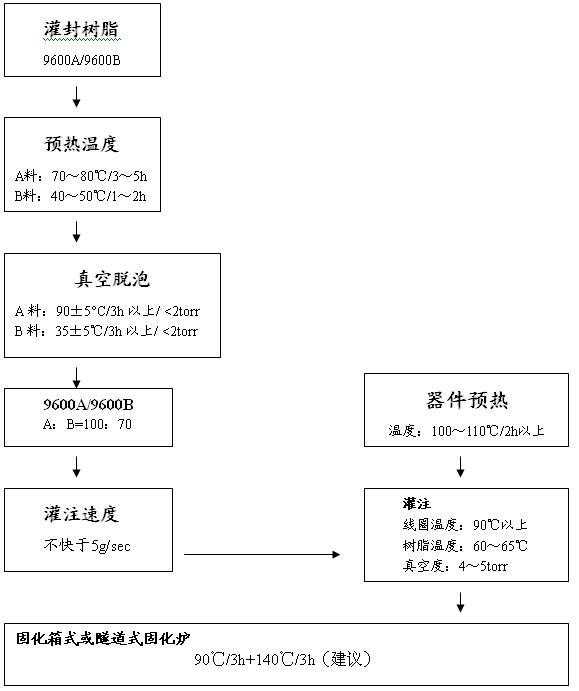 1) The A group contains fillers were easily layered, mixing before use must be fully uniform, can be 80 ~ 90 ℃ under the conditions of pre-drying in order to stir 6 ~ 8h. 2) B group of low-temperature storage may have crystal can be 40 ~ 50 ℃ under the conditions of heating to dissolve and then re-use. 3) by the ratio of accurate measurement of A, B groups were not matched the impact of the prevention of post-curing properties. 1) The workplace should be equipped with ventilation equipment and to ensure ventilation. 2) the operator should wear protective tool operation, avoid direct contact with materials. 3) If the material accidentally spilled on the skin, use clean cotton cloth, etc., or with warm water after the alkali-free soap to wash, skin irritation or serious burns asked the doctors to help. 4) Any vapor inhalation when feeling unwell immediately carried Office Outdoor ventilation. 1) at low temperature, the shade for storage (preferably 15 ~ 25 ℃). 2) confined to the preservation, in order to avoid entering the water or other impurities. 3) adhere to FIFO, used in the shelf-life period. 4) open barrel, it should run out as soon as possible to prevent moisture absorption of impurities into or, if not used after a one-time residue letters should be good.